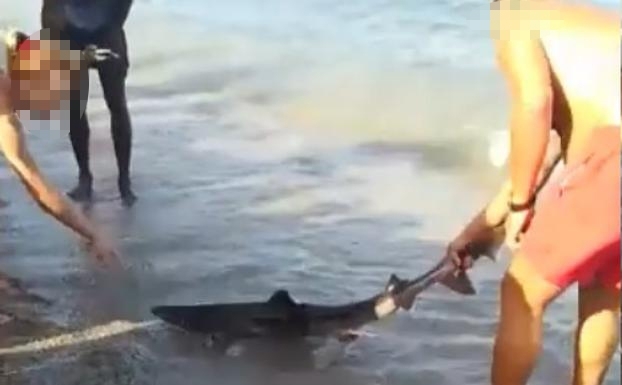 BEACHGOERS who posed for selfies with a stranded shark before returning it to the sea have received a snappy put down from emergency services. They have been told they should have left the one metre long shark alone so professionals could have made sure it was in a healthy enough state before releasing it. Although the shark was later found and retrieved by Equinac animal rescue charity and taken to the Aquarium of Almeria, it has since died. People gathered round the shark when it was found in shallow water at the Romanilla beach at Almeria’s Roquetas del Mar. Lifeguards could not stop the crowd from closing in intent on taking selfies with the injured creature. One man then grabbed it by the tail and pulled it out to sea. Now Civil Protection officers have said this was almost exactly the wrong thing to do and are reminding people that there is a strict protocol to follow when animals stranded on the beach are found. Bathers should have notified 112 emergencies who would have sent a team of specialists to examine the shark. Because it had cuts to the head and a fin it would have been treated before being set free.
? Selfies con un tiburón en Roquetas. ? Los bañistas tiran de la cola al animal y se hacen fotos con el pequeño escualo herido en la orilla. ? Lo correcto: llamar a @E112Andalucia. ? @canalsur ➡ https://t.co/flALHyka8E ?